Ever since she saw the Summer Olympics as a child, Katie has been eager to sweat and train. Now she's passing her passion along to her daughter! Years of dance, track and field, bodybuilding, outdoor activities, and now CrossFit have helped Katie Mackintosh build a massive repertoire of fitness possibilities. 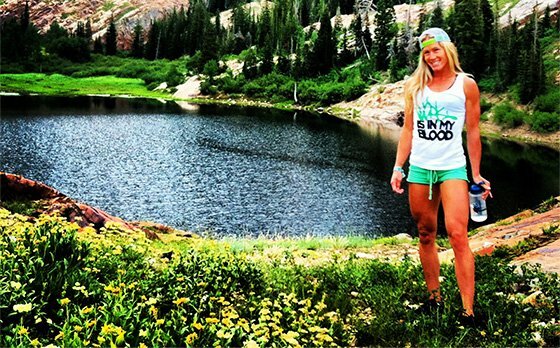 She guides her daughter and her friends through obstacle courses, hikes the Wasatch Front with her friends, and still finds time and energy to crank out a wicked leg workout. There&apos;s no stopping her! The fit life is never easy, but with her history of fitness in her mind and BodySpace at her back, Katie finds the strength to get it done. She told us how. I have always been active. I am competitive and love being challenged. My first inspiration came from watching the Summer Olympics as a child. I was so impressed by the men&apos;s and women&apos;s Olympic track and field events. I couldn&apos;t believe the combination of strength, power, and speed, as well as the appearance of these athletes—especially the 100- and 200-meter sprinters. It was at a young age that I decided I wanted that for me: the performance, the power, the functionality, and the look. Through the years, since a young age, I have been "fine-tuning" the different phases of fitness I have been in. As a dancer, I focused on my cardiovascular fitness, keeping myself more lean than muscular, but very flexible. After dancing, I turned my focus to becoming more muscular. I started a bodybuilding and strength training program, splitting different body parts on different days. Katie&apos;s varied athletic past gave her a base to build a physique for the figure stage. She still uses gymnastics to assist her bodybuilding workouts. After competing for a couple of years in figure contests, I made a decision to shift my training toward strength and performance. I began learning new skills and even took specific Olympic weightlifting classes. I also started working with gymnastics movements like handstands, handstand walks, dips, pull-ups, muscle-ups, and intense core work. Having complete control of my body in all planes of motion is key to maximizing my body&apos;s performance. I had been purchasing my supplements from Bodybuilding.com for many years and I didn&apos;t realize that it had the BodySpace site where you could have your own personal profile, follow like-minded fitness enthusiasts, be inspired, gain knowledge and create amazing friendships. I saw it one day, signed up, and it&apos;s been a part of my life ever since. I&apos;ve built a huge support system with some of my most amazing, kind, supportive, motivated, and humble friends. They&apos;ve held me accountable at times when I slipped or wasn&apos;t as motivated as I wished. I can also always count on BodySpace for awesome workout tips, clean-eating ideas, and extremely motivating physiques that make me want to work that much harder to reach my goals. To achieve total physical fitness, Katie built a body that can move. Sports, Olympic lifting, and CrossFit all have a space on her calendar. What is the benefit of something like a dirty dash? Is it just for fun, or does that actually help you as an athlete? The benefit from an athletic standpoint is it&apos;s a great opportunity to test my body&apos;s limits for both endurance and athletic performance. Outside of that, I love the fun factor and camaraderie we build as my friends and I run and crawl around in mud, jump into lakes and climb over obstacles. We support each other and enjoy success together in ways that could never be found inside a gym. By far my favorite muscle group to train has to be legs. I love the strength and power I&apos;ve built in them through the years. My legs are now stronger than they have ever been. Here is a sample workout of a leg training day for me. This workout takes 65-70 minutes to complete. Increase the weight as reps decrease on the squat and deadlift for each giant set. Increase weight on lunges up to a 45-pound plate max. Perform the exercises in the giant sets back-to-back without rest. Rest 90 seconds after each round. Do you have any fitness heroes? Annie "The Iceland Princess" Thorisdottir, a 2-times Crossfit Games champ. Also Dana Linn Bailey, the first-ever Women&apos;s Physique Olympia champion. Both are she-beasts who provide huge inspiration and motivation to me. Is it all iron and diet with you? What do you do for fun outside of fitness? First and foremost, I&apos;m a mother to my beautiful 8-year-old daughter. I love to be her biggest cheerleader, mother, and best friend. I&apos;m also an outdoors girl. I love hiking and mountain biking in the beautiful Utah mountains. I love going to rock concerts and watching movies. I love to laugh and love, creating memories that last a lifetime with the people whom I&apos;m closest to. 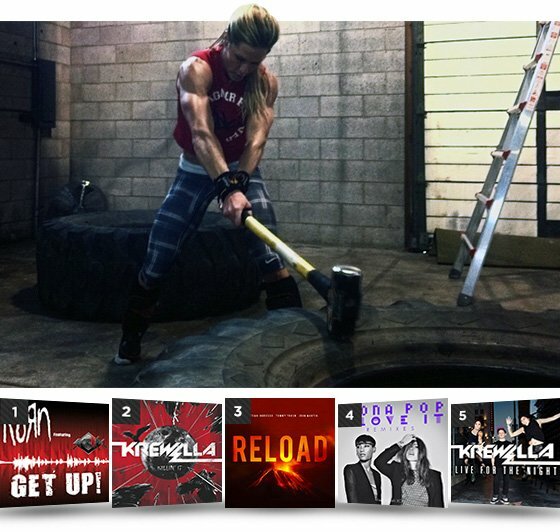 When I train, I&apos;m in the mood for something loud and crazy that gets me all riled-up, like dub and electronic. As a mother, what do you think we should do for to educate children on the benefits of fitness? I believe we are not doing enough to educate children of the benefits of fitness. That is evident in the level of child and teen obesity in the United States. "I make sure we all get out and enjoy the sun and outdoors, especially in the summer." I know how much I influence my daughter based on my lifestyle and daily routines. I do my best to instill a love of fitness in my daughter&apos;s life by constantly inviting her to take part in the workouts, kickboxing, gymnastics, mountain biking, pull-ups on the monkey bars at the park, and even "child sized" weight training alongside me. She thoroughly enjoys it! I look at the world around me as a big amusement park. If my daughter and her friends see it that way too, because of my example, they become more active, develop healthy habits and enjoy the benefits of all the extra movement, strength, and stress relief. "Actively" chasing my daughter and her friends around on their rollerblades, riding bikes, and going on long walks. I like to set up fun little obstacle courses for my daughter and her friends to run through. I make sure we all get out and enjoy the sun and outdoors, especially in the summer here in Utah. I never knew when I joined BodySpace years ago that I would meet so many amazing, inspirational, and like-minded friends. To be an inspiration to them and many others over the years has made me want to be better and push myself harder in so many ways. How important is it to surround yourself with positive, fitness-minded people? It is "life-changing" important. You have people who support your lifestyle and goals. You can learn from all these people when it comes to exercises and healthy eating habits. They can challenge you and be positive and uplifting in your life. Between having a full-time job and being a single mom to my 8-year-old daughter, I still manage to get my training in and make sure that her schooling and extracurricular activities are all taken care of and her needs are met. The weight room is important to anyone who makes a physique goal, but life outside the gym provides other opportunities for exercise and exhilaration. I feel we make the things we are most passionate about our top priority; in my case it&apos;s God, my daughter, family, friends, and then my training. Planning and managing it all is the ultimate job for me. Thank goodness for the iPhone calendar! My attitude and mindset keep me from getting too tired; I train my attitude and mindset as I train my body. This definitely can be the difference between winning and losing! Utah, like most western states, is filled with outdoor wonders. Do you take advantage of the terrain in personal fitness challenges? I love the outdoors, especially in Utah. My girlfriends and I go on extremely difficult and challenging hikes at 6 a.m. almost every Saturday morning. It is the most amazing feeling to be surrounded by such beautiful, breathtaking, scenic mountains with all the waterfalls, lakes, trees, and steep, rough, rocky terrain. I live 5-10 minutes away from both Big and Little Cottonwood Canyons. I feel blessed to be surrounded by some of the best climbing, hiking, mountain biking, skiing, snowboarding, and scenic beauty in all of the United States. Training here can be as diverse as you choose to make it.